new markets, according to Vladimir Sysoev, product manager, automation, Epiroc. As the numbers come in, the competitive advantage realized by those companies able to make the shift will become palpable. According to Jacques, that will prompt next-generation partnerships and solutions. “That means that soon we will have another industry,” Sysoev said. “New areas will be opened, new businesses, whatever they might be. It is quite an exciting time that we are living through.” Indeed, recent headlines on some of the latest partnerships, projects and innovations indicate that, industry-wide, the culture is shifting. 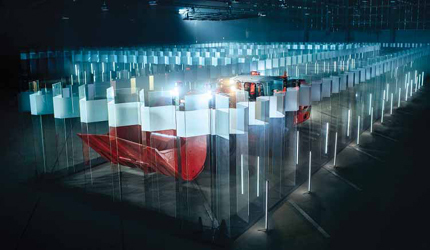 In September 2018, Sandvik released a video of an unmanned loader navigating a glass maze. OptiMine is the supplier’s gateway Industry 4.0 solution. Beyond the aforementioned features, it offers mine scanning and visualization, equipment location tracking, scheduling, and task and case management. “The solution provides transparency of underground operations and enables joint development of mining process efficiency supported by our experts,” the company reported. 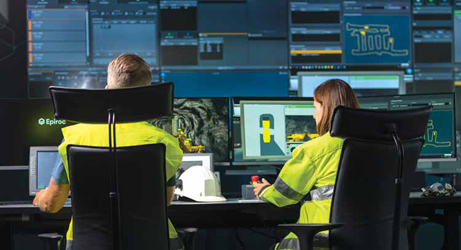 The agreement is the latest between Resolute and Sandvik for mine design work at Syama with the goal of full automation. Company reports state the partners collaborated early on on equipment selection and the design of the underground infrastructure. Pulli said what emerges as one result of the new age partnerships described by Jacques is “a shift in some of the traditional job profiles, for example, from equipment operators to system supervisors.” Emergent automation-centered “technologies may actually provide more job opportunities for people in safer, more comfortable and more creative roles.” The vision of man using machine for a net improvement of his lot has been the bread and butter of futurists, and the bane of Luddites, for decades. It is a vision shared by others in the sector. An example of the type of technology to be developed and perfected includes an underground truck automation system, successor technology to that which can now be leveraged by Epiroc’s MT42 mine truck. The first generation of the truck hit the market in 2011 after two years of trials in Canada and Sweden. It comes with the company’s Rig Control System (RCS), allowing for varying degrees of automation. Another example of the type of technology that will likely be developed, perfected and trialed at SUM is an underground loader automation system. Predecessor solutions would include the Scooptram Automation Regular package, released by Epiroc in June 2018. The package allows for remote control that can “quickly and easily transition from manual to automatic mode,” the company reported. Schill is in the process of establishing an application center in the U.S. to provide automation and digitalization solutions support and resources. The goal is to plot “partnerships that we can build” and to service existing partnerships. Among other things, the team will qualify, prepare and guide customers on adoption and deployment. “The first level is to use the data that we have today, and perhaps to do some dashboards, helping the customer to realize what their operation looks like,” Schill said. The next level is optimization projects, “where we, together with the customer and the data, make a bigger analysis of how we can improve efficiency,” he said. The third level would be partnering on adoption and system integration. “A lot of customers already have systems in place from other suppliers they want to be integrated with our system, whether our control system or telematic solutions,” Schill said. “We would have the resources to be able to help out with that, and tailor-make our solution to fit the customers.” The barriers to adopting automation solutions are twofold. First the infrastructure must be in place. Next, the culture at the mine must accommodate the change, according to Byington. “One of the barriers is getting the operators to actually use the technology and to embrace it,” he said. Automation has long been a goal for the industry, with Australian majors such as Rio Tinto pioneering the way using remote- controlled haulage trucks to shift iron ore in western Australia. 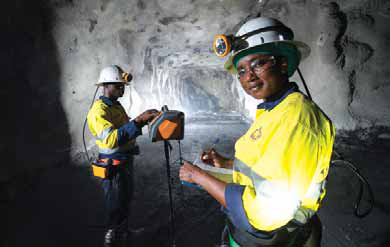 Syama gold mine, 300 km south of the capital Bamako, however, takes automation to another level entirely. Syama’s entire fleet of vehicles will be operated from the surface, which makes it the only operation in the world to hand over blasting, rubble clearance and ore removal — the entire extraction cycle — to autonomous machines. “We started looking at automation and the level of productivity it would produce,” said Peter Beilby, COO of Resolute. “The numbers made financial sense.” A fiber-optic network is fitted throughout the mine, connected to a control center on the surface. This will keep the vehicles and machines online. “Other operations are doing partial automation, but we are the first to put it all together and do everything,” Beilby said. Syama was originally developed by BHP as an open-cast gold mine in the 1980s, but Resolute acquired it in 2015 and began looking for ways to blow new life into the aging asset. A positive definitive feasibility study completed in 2016 showed the geology was suited to a long life, low cost underground mine. Syama now has a life of mine of 14 years, with an underground ore reserve of 3.5 million ounces (oz). All-in sustaining costs are US$746/oz. This is a decrease from earlier projections of $881/oz. With sublevel caving, blast holes are drilled up from below into the ore body. The ore body is collapsed down into a draw point, where the ore is collected and extracted. As technology evolves, savings are expected to improve over time. Syama is now heading toward 200,000 oz/y of gold production, but intends to reach 300,000 oz/y, Beilby said. Full production will be reached in June 2019. The trucks, robotic loaders and drills are supplied by Swedish mining engineering specialist Sandvik. Resolute opted for Sandvik as its equipment was “mine ready” using its AutoMine and OptiMine systems, said Beilby. Automation is not the only innovation Sandvik is deploying at Syama. The 422iE jumbos that will carry out the drilling are also fully electric, saving on the need to run diesel pipelines underground for refueling. Charging is done off existing infrastructure. Multiple trucks can operate on the same incline, and a dedicated traffic management system keeps them out of each other’s way. Trucks are fully capable of navigating themselves both underground and on the surface. Altogether, Resolute expects to save around 15% in operating costs. Some of the cost benefit is in reduced downtime, with no handovers at the end of a shift, said Neil McCoy, key account manager in Sandvik’s Johannesburg office. Nor do operators have to travel underground to get to their machines. This keeps the equipment running at up to 22 hours a day, rather than the 15 or 16 hours they worked before. Automation also means fewer operators, whose skills command a premium. “The big issue we’re looking at is the lack of critical skills,” said McCoy “Automation is the tool to bridge the skills gap.” Countries such as Mali face another impediment to attracting skilled technicians and operators; ongoing conflict and extremist activity. The UN regards its Mali peacekeeping mission, installed after a failed coup six years ago, as its most dangerous. In October 2018, two peacekeepers based in Ber, close to Timbuktu, were killed when the blue helmets repelled a motorized attack. Autonomous machines mean that companies can reduce their staff demands in troubled countries. Along with reducing the number exposed to the inherent dangers of mining, which is a win for all. Still, a touchy issue surrounding automation is the potential threat to jobs, and the fear that men will be replaced by machines. Mali ranks 175th out of 188 countries on the UN Human Development Index for 2016, and the average wage is US$1.25 per day. Resolute may save having to fly in expert technicians, but it could deprive Malians of desperately needed jobs. Sandvik’s McCoy added that even automated machines still need mechanics, electricians and other specialists to keep them functioning. The Sandvik fleet will for the most part self-diagnose problems, letting the operator know its status. This will then result in a technician either being dispatched or the vehicle being called to the surface.